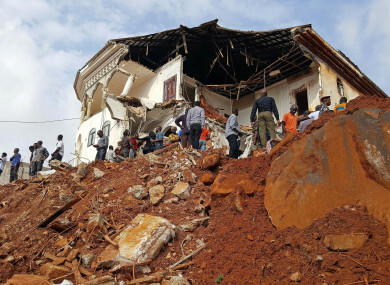 FOUR MONTHS AFTER the landslides that killed her husband and more than a thousand others, Mariama Kamara has returned to the mountainside that collapsed onto their home to live in an unfinished building. Kamara is one of hundreds of Sierra Leoneans recently kicked out of three government camps set up in the wake of the 14 August disaster, when heavy rains caused the partial disintegration of Sugar Loaf mountain, now a red rock scar looming over the country’s capital. That day, heavy rains lashed the slopes left bare by chronic deforestation in Freetown, and huge boulders suddenly detached, rolling onto informal settlements, crushing shacks and enveloping entire households in the Regent district in red mud. “We are back again at Regent, trying to pick up what is left after the disaster,” Kamara told AFP, breastfeeding her eight-month-old son while sitting on a cinder block. Handed €280 (235 euros) by the British government and the World Food Programme to start a new life as a widow with three young children, the 27-year-old felt she had little choice but to return to the danger zone she had fled. “I sold some of the handouts to pay transport fare for my two children to go to my mother, until I find a suitable place,” she explained, describing how she ended up living in one of four unrecognised settlements in the Regentarea. There are fears another landslide could strike Regent when the next rainy season rolls around. Despite the lack of sanitation and shelter, a school still operates in the ruined mountain district, with around 300 children learning to read and write in a building with no roof, doors or windows. Many of the students were orphaned in August. Francis Abu Sankoh, a community leader, said the government had told him everyone eking out a precarious living had to get out by mid-November, but he refused to co-operate. “We will not force these people to leave while they still have nowhere else to stay,” he told AFP, saying he knew of nearly 200 households living in half-finished structures in Regent. Relief workers are meanwhile exhausted after four months filling in for a government that is too under-resourced to carry out basic disaster management, with the Red Cross handing out its own payments of $300 to 1,000 people in late December. “We have played our part to respond to the emergency, and it is time to release the affected victims,” said Father George Crisafulli, Country Director for Don Bosco Fambul, an orphanage turned halfway house for homeless Sierra Leoneans. “It is the responsibility of government to provide financial support and housing for them,” Crisafulli added, as he prepared for the imminent departure of around 100 pregnant women and new mothers. He noted that the government had promised to give financial assistance to child victims via a mobile money wallet, but they were yet to receive anything. Children who lost their parents would remain at the centre, he said. Some orphaned children were taken in by families, but many are too poor to feed another mouth while facing their own dire straits, said Cecelia Mansaray a project officer for British charity Street Child. In the last 15 years, four major floods have affected more than 220,000 people in Sierra Leone and caused severe economic damage, according to a World Bank report issued in September. This summer’s was the deadliest yet: 1,141 people were declared dead or unaccounted for, according to official figures. The World Bank estimates that $82.41 million is needed over the next three years for the recovery, or about 2.2 percent of GDP, including rebuilding the six health centres and 59 schools affected. Access to clean drinking water is also a serious problem. Efforts to resettle flood victims in previous years have failed, as the government has directed them to Mile Six, an area without transport links, running water or electricity — even if it is safe from the weather — meaning residents soon drift back to dangerous neighbourhoods that have easier commutes. Ismail Tarawali, Head Coordinator of the Office of National Security (ONS) which oversaw relief efforts, has accused some families of making “fake claims” for survivor packages. In the medium to long term, Tarawali said affected households would be given extra relief — if there was money to pay for it. Meanwhile 52 affordable houses with basic facilities are also under construction at Mile Six, and a mortgage scheme will be developed for survivors who had valid land permits for their damaged houses, he said. But eligibility will likely only apply to a tiny fraction of the victims, while the rest will find themselves back where they already were, living on the edges of society with everything to lose from next year’s floods. Email “'They have nowhere else': Sierra Leone mudslide victims move back to homes in danger zone”. Feedback on “'They have nowhere else': Sierra Leone mudslide victims move back to homes in danger zone”.